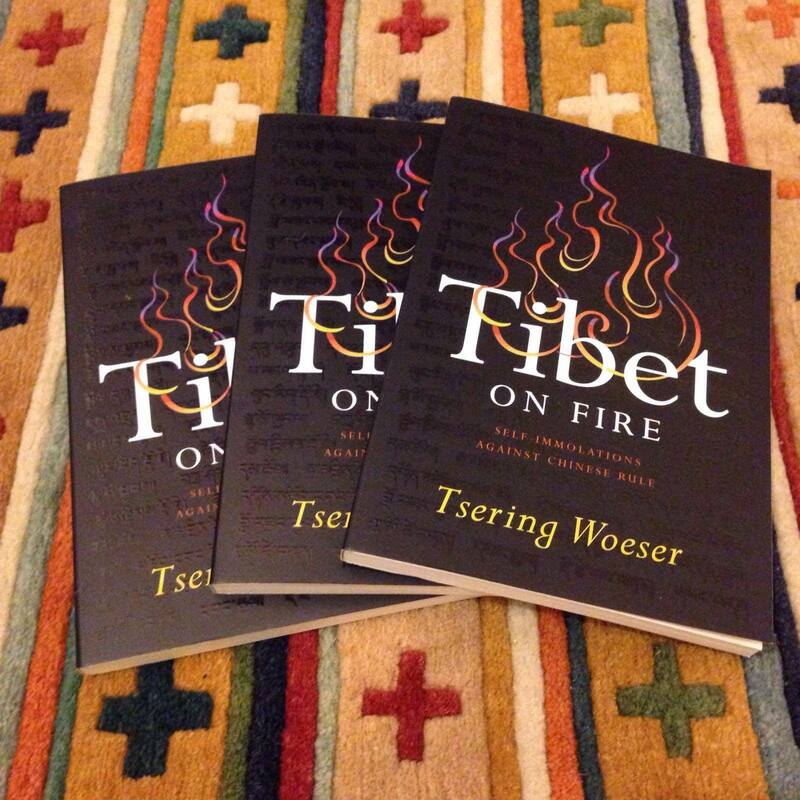 “Tibet on Fire: Self-Immolations Against Chinese Rule” by Woeser, translated by Kevin Carrico, was published at the beginning of 2016 by Verso Books. The cover image was designed by Chinese dissident artist Ai Weiwei. A huge thank you to Tsering Wangmo Dhompa for this review. Late in the afternoon of 29 February 2016, Kalsang Wangdu, an eighteen-year-old monk died after setting himself on fire in Kardze, in Eastern Tibet. That was also the day when Dorje Tsering, a sixteen-year-old student self-immolated in Dehra Dun, India. From his hospital bed, Tsering said he had set his body on fire because he had always wanted to do something for Tibet . He died four days later. Since March 2009, 144 individuals inside Tibet, and eight Tibetans in exile, have protested against the Chinese government by immolating themselves . 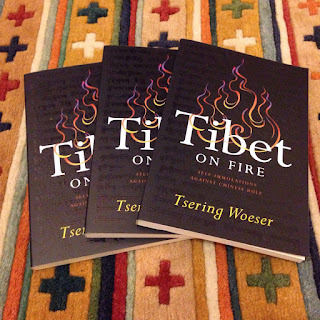 It is these devastating events that Tsering Woeser attempts to analyze and understand in Tibet on Fire: Self Immolations Against Chinese Rule, published by Verso in 2016. Journals such as Cultural Anthropology, Revue d’Etudes Tibétaines and Seminar have devoted issues to the Tibetan self-immolations and the responses from scholars, artists, politicians gesture to the difficulty of ascribing meaning or fully comprehending this tragic phenomenon, but they recognize, too, the necessity of a response. Likewise, books such as Self -Immolation by Jamyang Soepa and Tibetan Self-Immolation: News, Views and Global Response compiled and edited by Bhuchung D. Sonam attempt to understand and record the acts. Woeser’s analysis of the self-immolations commands notable confidence not only because she is one of Tibet’s celebrated cultural critics and writers, but also because she knows life in Tibet . She understands state power, censorship and violence: her book of essays Xizang biji (Notes on Tibet 2003) was banned in Lhasa and she was made to resign “voluntarily” from her job as an editor forXizang Wenxue (Tibetan Literature), the official journal of the Literature Association of the Tibet Autonomous Region (TAR) . Yet, she has taken on the responsibility of documenting every act of self-immolation and sharing the information on her blog; her work serves as a source for many existing writings on self-immolations. Tibet on Fire emerges out of the writings on her blog and the chapters maintain features of essay as well as reportage. The book attempts to answer, among other questions, these: How did we get here? How do we understand the self-immolations? It is also a powerful critique of the “wanton exercise of the power” of the Chinese Communist authorities and the international community’s apathetic silence to the death of 125 Tibetans (vii). Woeser determines February 27, 2009, as the day “that self-immolation came to Tibet” (1). This is the day that Tapey, a monk from Kirti monastery, one of the major monasteries of the Gelugpa sect in Tibet, set his body alight in Ngawa within Amdo . Many Tibetans had boycotted the celebration of the Tibetan New Year that year to mourn the first anniversary of two traumatic events: the riots that took place in Lhasa on March 14, 2008, and the day Tibetans remember as the “Ngawa Massacre” when military police fired into a crowd of peaceful protestors in Ngawa, killing twenty Tibetans. Woeser reads Tapey’s protest as a continuation of a response to the “wake up call” Tibetans experienced after witnessing the state violence in 2008; it is also the beginning of a new form of protest addressing the deep wound inflicted by the Chinese state on three generations of Tibetans. Many of Tapey’s generation were altered by the experience of watching Tibetans like them die in 2008. Woeser writes that this third generation of Tibetans living under Chinese rule suffer in five areas of everyday life: their beliefs are suppressed; their ecosystem is decimated and looted; their language is devalued and de-emphasized in their own education systems; Han population transfer into Tibetan areas is transforming Tibetan life and livelihood; and Tibetans live under “an Orwellian monitoring system” rendering Tibet into a vast prison. It is in such an environment that protests take form. Woeser writes that the self-immolations are not suicide, not a gesture of despair, and not to be understood or judged solely by Buddhist precepts, (as they are variously read in exile). She insists that they can only be judged “by its political results” (26). The death of each Tibetan is a “torch” shedding light “on a land trapped in darkness” (26). The death of each Tibetan is pointing to the memory and history of a long oppression. Woeser knows well this darkness; everything changed for her in March 2008. In the epilogue to Voices from Tibet, a book co-authored by Woeser and Wang Lixiong in 2014, Woeser writes about the silence that followed the violent suppression of Tibetan voices inside Tibet. It was the loudness of the Chinese State’s “propaganda machine” drowning Tibetan suffering and voices in the months following the March 2008 protests that compelled Woeser to speak out. She and Wang became the daily chroniclers of events in 2008. She points out in the epilogue to the book that writing became her own way to fight against oppression. To write is to “experience,” to “pray,” and to “bear witness.” For her, all the three intertwine. To bear witness, she writes, “is to give voice” (Epilogue). As with the events in 2008, Woeser feels the responsibility to document the self-immolations that take place in Tibet and to “share memories that simply must not be forgotten” (97). In that, the text is a testimony, homage, history, memorial, and a protest that insists the right to dignity for Tibetans in Tibet. 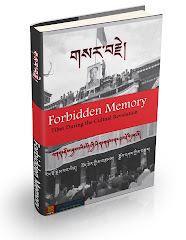 Analyzing the final words of fifty-six protestors at the moment of self-immolation, Woeser arrives at nine conclusions out of which Tibetan independence and national identity are core issues (37). Woeser argues that the “bravest protestors in Tibet” choose the radical method because it is the only method that will capture the world. But this is not to suggest that these are reactions out of hopelessness, on the contrary, she views them as “sacrifices” that seek to bring change. These are acts that protest. It is precisely because it is a form of protest against a systematic tyrannical government, that the protest will not cease till the root causes are addressed (65). It is the Chinese Communist Party who can halt these protests, not Tibetans, not the Dalai Lama, she writes. It is also because of these brave individuals that “Tibet, under siege, has not yet perished” (97). In light of their sacrifices, the lack of a meaningful response points to an unwillingness to bear witness to the horror of this act. Woeser chooses to cherish their memories, to respect and keep alive their aspirations. Remembering their sacrifice is to also remember that it is the oppressive racialized methods of control maintained by the Chinese state that undergird the self-immolations. Tibet on Fire is a brave call to the world to listen, and to understand what it means to live as humans. Voice of America, March 4, 2016. Woeser lives in Beijing but spends many months in Lhasa every year. 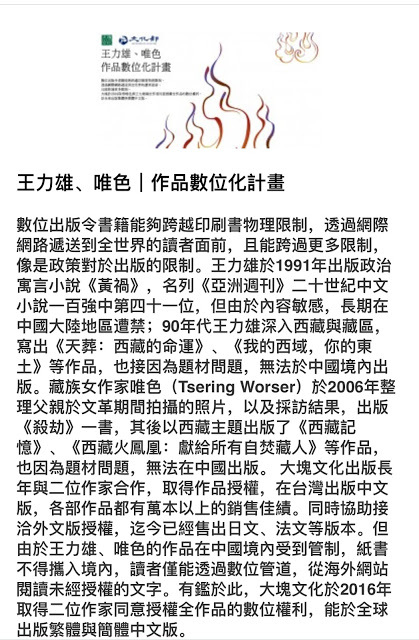 The official charges against Notes on Tibet were made by Shi Jifeng, Deputy Director of the General Bureau of Journalism and Publication, who stated that the book encourages “reverence to, and belief in, religion” through its praise for “the Dalai Lama and the Karmapa” (Wang Lixiong 2009 117). Now part of China’s Sichuan Province. Woeser Tsering. Tibet on Fire. London: Verso, 2016. Print. Woeser Tsering and Wang Lixiong. Voices from Tibet. Hong Kong: Hong Kong University Press, 2014. Print. “Self-Immolations by Tibetans.” International Campaign for Tibet. Web. 2 March 2016. “Tibetan Schoolboy Who Set Himself Alight Dies.” Voice of America. 4 March 2016.